Quinoa (Keen-Wa), this protein packed grain is an amazing base for this nutritious summer salad. Quinoa combined with diced chicken, tender grapes, and sliced almonds make this a powerhouse of summer dishes. My son has a multitude of phrases that he will use rather than curse. Does he curse when he’s with his friends? Probably. I’m guessing he’d be laughed out of fourth grade if he came out with things like “oh, fiddlefark!” when he dropped a football. Quinoa (keen-wa) is one of those words that could totally work in situations where an expletive would ordinarily spring from your mouth but then you suddenly realize there are little ears nearby. For those not in the know, you’ve coined a new G-rated interjection. Everyone else has been hit with a craving for this high-protein, wheat-free grain salad. Cook quinoa: put water in small saucepan and bring to boil. Stir in quinoa and salt, return to a boil then reduce to a simmer and cover with a tight-fitting lid. Let simmer for about 15 minutes or until nearly all the water has been absorbed. Turn off the heat, keep covered, and let sit for another 5 minutes. In medium sized bowl, combine vinegar, olive oil and salt and pepper to taste. Whisk well. Stir in quinoa and toss to coat thoroughly. The grain absorbs the dressing (and flavor) best when it is warm. Stir in diced chicken, almonds and grape halves and taste for seasoning. I find it needs quite a bit of salt. 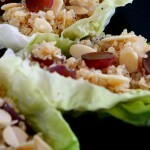 Pile spoonfuls of salad inside lettuce cups and eat like a taco! I read this article and found it very interesting, thought it might be something for you. The article is called For the Love of Quinoa! and is located at https://thefarmgirlcooks.com/for-the-love-of-quinoa/.